Looking to update your OEM Daytime Running Lights? I know what you’re going through. I was there myself. After looking for several months, I concluded I wanted to keep the original lights to keep the look closer to its original design. My original idea was to replace the OEM headlights with the Quote: “AUDI TT R8-LED PROJECTOR HEADLIGHTS” available on eBay. I personally liked the LED strip but was not to keen of its look. I was really disappointed after reading forums and articles posted by enthusiasts that installed the R8 LED Headlights; their manufacturing is cheap, they crack easily, humidity gets inside and their look is so-so. Search YouTube, you’ll find a few videos of the lights in action. The only good thing about them is that their price is cheap. But then again, you don’t get much for your money. So, after going through all this, I decided to search for LED strips that would fit in the blinker portion of the OEM TT Headlight. I also wanted the blinker to switch to amber-orange when flashing. And obviously, all this would have to fit with Audi’s ECU and have the right voltage and electronics. That didn’t go to well… I found a few guys that had tried it, but none had the OEM look, nor the switch for white-to-amber. I them stumbled on the “POGEA RACING LED DRL TTS” and was so happy! It did everything I wanted. Now priced at 429€ or 589$ US, it’s not a bad choice. Personally, I don’t like the fact that the DRLs stay light at the same time as the turn signals and I find the LEDs too small. IMO, they look like the cheap ones you get an any auto parts store for a few bucks. 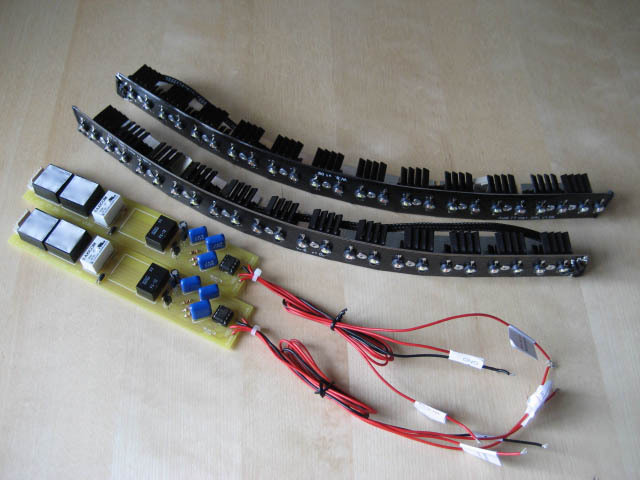 Still going on with the idea to keep OEM lights and OEM quality, I found Wak and Was who created their own electronic module and light strips. 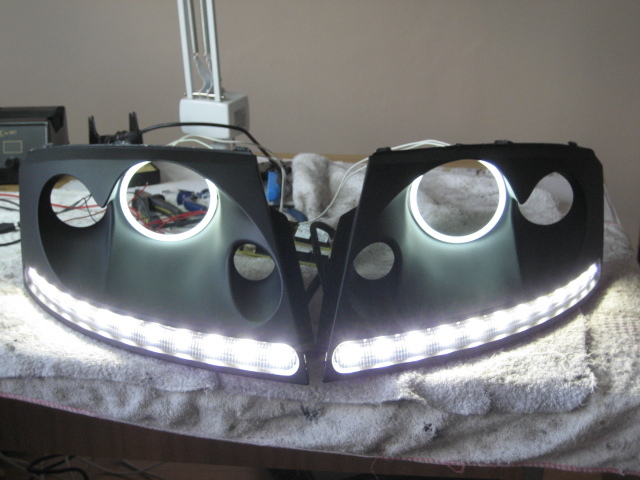 They only use the best quality materials and they are very similar to the POGEA RACING LED DRLs. So I went for their kit! I added a lot of personal touches to my headlights such as: smoke corners, amber side marker deletion (European headlights do not have the side markers, I prefer that), angel eyes on the high beams and finally, yellow high beams. The result is… incredible. There is no picture or video that can show the magnificent way the headlights look like. 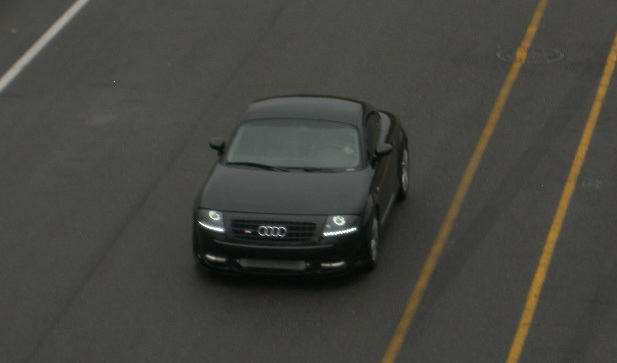 My TT on a race track, daytime. You can see the Angel Eyes and LED strip very clearly! True story: My TT is a Big Turbo V6 TT and when I come onto traffic on the highway, I come on it fast. Very Fast. So I usually have to use my high beams to “flash” the cars to leave the left lane. Well, one thing I didn’t know these new headlights would do for me is: I do not need to “flash” upcoming traffic anymore! For some reason, my headlights do the trick by themselves. I guess that the LED strip & Angle Eyes combination gets the drivers attention. They leave the left lane without me doing anything! L-O-V-E I-T. I made a deal with Was and I am now the official North American supplier for their LED Headlight strips. Note that the N.A. strips are fairly different from the European ones as some differences exist in the way they are used and build. A few weeks of R&D got us through. It’s an easy install and comes with instructions. They are custom made and require about 2 weeks before going to delivery. The kit includes everything needed for the install. It’s a fun project and assures you to be only one of a kind. 🙂 See videos HERE. This is the kit with the modules. It’s an easy install. Does the kit price include the new inner shell with the amber markers deleted? If not, where did you source those? Thanks! But I can get you a used set directly from Europe. I believe they go for 150$ or so. Andre, do you sell the angel eyes also? Is so what is the cost alone and with the led kit? Thanks. 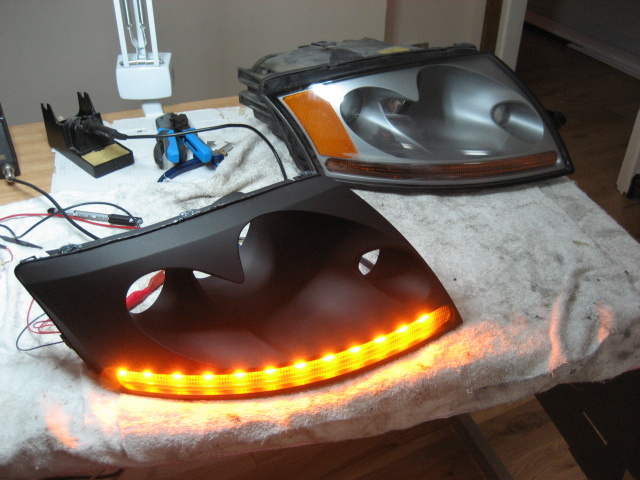 Angel Eyes pricing varies, but good quality and long lasting should cost around 150$. I can send you some at the same time. (it’s what I have on my car) In my opinion, it looks much better. The cost is 629$ for the strips + 150$ for the Angel Eyes. In fact, I just sent out a kit like it this morning! Andre does this drl dim when the headlights on? Yes, the DRLs dim 50% on low beam/headlamps on. They look incredibly good. No joke. WHat is the lead time for this parts to arrive after paying PAYPAL? Does any of the kit have full blown instructions? OH, almost forgot, I’m in Long Beach CA. Where are you located? The Euro specs DRLs and North American are not the same. I did R&D with Was (well it was mostly him) and I sent my own headlights to him. We then collaborated and Was finally created an N.A. LED DRL set. There are instructions coming with the kit. I am presently working on creating a better one, but the actual one is self explanatory. I’m located in Montreal, Canada. Stay tuned, as I will take a few video shots of the lights today. Just to clarify, these DRL’s are 100% Was’s product, he is just a friend to me and I helped him with promotion. Where he has forged ties and distribution is purely under his control and I simply forward inquiries to him hence the reason I would not know or mention his distributor arrangements myself. Thank you for your comment. Indeed, I am a “Was distributor” located in North America. Any questions about distribution can be sent to Was directly. For product inquiries, simply browse to my Audi TT DRL page. I understand your concern! I went through the same thinking process myself at first. Still, any body workshop can do it for you. 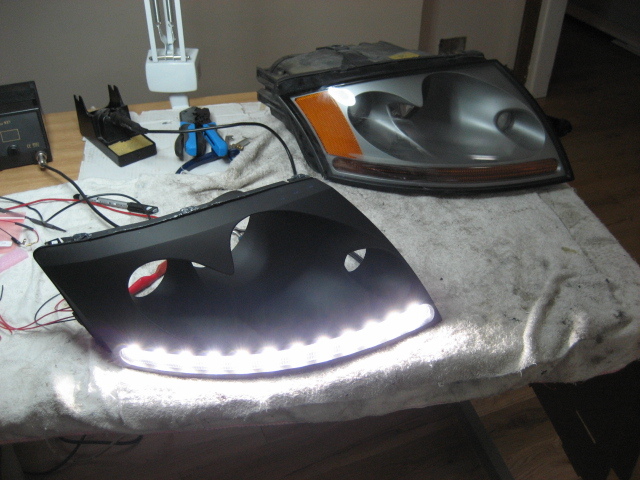 Just bring them the LED DRL strips, the instructions and they will take care of your headlights. I can assist you if you need help in any way. I am installing this kit for a customer right now. It is a very good kit. The instructions are not detaled enough on what needs to be trimed. On this car (Canada) it has DRL right next to the signals and no holes needed to be driled. And I did need to find the gray wire elseware in the head light. We are working on creating a better instruction guide and I would appreciate your thoughts on what you think we should be adding to the guide. These look very good…my ?’s are, can I get the ineer shells with the markers deleted…Strips and Angel Eyes…and clear DRL cover to replace the standard amber one? How long to receive when paid for? Is there a warranty for leds? The cost is 699$ (drl + angel eyes) + 80$ for the smoke corners. Delivery is about 2-3 weeks. The leds are hand made and 100% tested before shipping. Warranty is with the manufacturer and is 1 year. In 6 years, only 2 have failed, on only on install, not after installation. The beauty of it is that led strips last long! And the look is… awsome! I am very interested in buying these. I live in Ottawa but can make the trip to Montreal anytime, would it be a problem to pick them up in person? Just let me know in advance so the kit is ready for you. Hi Andre, anyway to get a rush on a kit? I tried buildling my own, and they work fine, but the LEDs aren’t bright enough for daytime use… so now I have the autobody shop that’s doing my work waiting on the headlights before completing final assembly. how quickly can you get a set out to me? My lenses are heavily oxidated. Is this something that can be fixed during this process. If not, do you all sell replacement lenses? Yes, they can be replaced at the same time. Dealership sells the lens for bout 100$ each. Grats on ur progress with ur DRL-LED kit ! would you please provide me with the headlight lens part number so i can provide it to the dealership when ordering ? The dealer will provide you the part number, as it’s not the same for right and left. Just got my DRLs in the mail, and there were no instructions included in the kit. Can you either email me the instructions or send me a link where they can be found on-line? I was wondering if you could find the part number you used to get your new lenses, because I have talked to a few dealerships and they said they only sell the whole headlight assembly. Any help on this would be greatly appreciated because one of mine is cracked and I dont want to buy a whole light when I only need the lens. This is not an OEM part. Dealerships can source the part from aftermarket manufacturers. A Google search could help find these manufacturers locally. If you can’t find them, write me back as I know one in UK. Thank you for the quick response! I have looked and call all over and I can’t find anything. I would greatly appreciate it if you could get me in contact with the aftermarket place in the UK. The headlights do not have identical interals even though they look the same! So the wiring is different from one another. I would like to get the strips for a 2008 model TT. Do you have them?? Hello! My fiance really wants these lights, and I want to give them as part of his Christmas gift. But since I know very little about cars, I have to assure me of a few small things before I order from you. Firstly, he has a European TT 99 model – does these light work on his car? Second, is it possible to use angel eyes on xenon headlights? Nice kit. Is there a way to run this kit and not lose my fog lights? Also, i noticed in your videos, that when the signal is blinking, the lights are yellow, but white otherewise. Does it have to be this way or can i have my lights stay white then blinking? No, you loose your fog lights since the DRLs need the extra power from them. BUT the LEDs are very bright and are half way between fogs and no lights at all. I often let my DRLs act as my only lights at night time! These plus angel eyes gives the car a very nice lighting effect. And yes, I can prepare a special version with white blinkers, just for you. I would like to purchase a set but with YELLOW blinking lights for the turn signals. Can this be done since they are made to order? Please contact me. They are amber, not yellow. By default, the LEDs are white and switch to amber when blinking. I have one set left ready to ship. Since they are hand made, production time is about 2 weeks + shipping. Can they be special made with yellow LEDs and not amber? Would there be a different price? Hope to hear from you soon. I am interested in these but I have a quick question. Is there any problem installing these into the OEM Xenon headlights? None whatsoever! Mine are Xenon as well. Is it possible in 2012 to order the full kit ? What Is the cost for it including shipping to France ? Are they Xenon 6000k color like ? Thanks and have à nice day from France ;). Le kit comprend les DRLs et les Angel Eyes. Pour les clear corners, tu peux les trouver enligne un peu partout. Je te donnerai une adresse si tu n’en trouve pas. Les DRLs sont d’un blanc pur. Les Xenon ont une touche bleutée, donc légèrement différents. Mais le look est nickel! C’est ce que j’ai sur ma TT. Do you sell, or know of any similar kit of the same quality for the MKII TT? Unfortunately, the kit is for the MK1 only. I have been emailing with Wasim, but he has gone quiet on me, and not heard from him for 2 months on ordering these. I also emailed with Wak, who hasn’t heard from him either. I’m in San Francisco in the US, so should I just order from you? I’m interested in the wiring and spec comment you made above, that it’s different for NA than it is for Europe. Do you have different instructions to Was? Or does he have to make them differently for NAmerican car? Also, is this for the LENS type or the OEM type that he makes? Both OEM and LENS are different in Europe and NA. Was and I made sure we had a working NA version and my own set of lamps were the ginny pigs. Hi Andre, I was asking more about the price as I think OEM version is cheaper than LENS one? So is the $629 (usd?) for the LENS one or OEM version. Also I’d like the Angel Eyes with that and the clear corners, and Shipping to California (San Fran Bay Area). Are these options one chooses on the Ordering page? I haven’t looked there. No they are the same. I do not sell the clear corners, but you can find them on ttstuff. There is a lead time for production of about 2 months before they are shipped. I’ve been in the painful process of trying to upgrade my 09 mk2 with led drl strip. Will this kit work? I was wondering if I could set up a group buy, I could probably get atleast 5 guys if not more to purchase these. Is there any possibility in a group buy with special pricing? Not saying this kit isn’t worth it, but it’s still quite pricey regardless. Yes, I’d be interested to! I’ll generate numbers and pm you. Ok great I only started asking around yesterday and already have 4 people interested in a group buy if the pricing is right, I’m sure there are more to come. ok, let me know how many potential clients you have. A minimum of 5 will get better pricing. These are hand made and the cost of material does not go down if I buy more parts from my suppliers. But I will make my best so you guys can get a price reduction! I already have 6 potential clients myself included. If the price is right we can put this order in soon. However, I believe I may be able to get atleast another 4 people in the next week if 10 or more would fetch an even better price. I find it interesting that you deleted my last post about how your kit is actually more expensive than the Pogea unit. Competition is what makes the consumer have power, I’ve looked at both kits and the craftsmanship looks nearly identical do paying more for yours wouldn’t be “better value” just a personal choice, if people do find out about this you will certainly lose business unless you are willing to take a cut on your profits. It’s your call obviously. 10-4 Adam! Updated the post. Thanks! Hi, is this product still available?! Also, are you able to get me clear headlights lenses?!! do U know any company where can I buy only front clear headlights lens of the Audi tt 2003. My assembly is OK….. but the lens are in really bad shape at the inside and outside. Also, are you able to get me clear headlight lenses? Do this work on tt 2003 ? I have sent you a email regarding these LEDs Hopefully you get back to me soon! No worries I wasn’t sure if you were still making these 🙂 ill be looking forward to your email response. I’m still interested in your custom running lights, and I still have not got an email from you. I hope your still making these. hi my friend I will like. to have info. about this lights. before taking a decision Because the only thing I know about it is. they look beautiful. please let me know the price, and how is the installation and whatever info.related. is there any way you can at least get your hands on the LED HALO Lights? I have not yet herd from you. Any updates on these lights? What is Was doing about me returning mine to him to fix the ones that are only showing 6 white and six amber ledâs and not the 12?? I havenât heard back from you or Was on this for months nowâ¦. Hi David. Did Was fix your lights in the end ?